Over 90 percent of Americans celebrate Christmas, but the "How?" and "Why?" of those celebrations aren't quite as clear-cut. Are You a Pajamerican or in the Confeduckeracy? Decide Now. 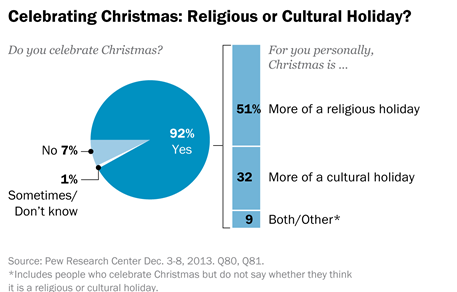 Over 90 percent of Americans celebrate Christmas, but the "How?" and "Why?" of those celebrations aren't quite as clear-cut as the "War on Christmas" brigades would have you believe. How you celebrated as a child has a huge influence on your approach as an adult, but some traditions have a stronger hold on today's grown-ups than others. According to a pair of surveys out this week, just half of Americans see the holiday as a primarily religious one, and about a third of Americans mainly celebrate December 25th as a cultural day, according to Pew Research. The Pew study also provides an interesting point of comparison: What do Americans remember doing on the Christmases of their childhoods, and what do they still do now, as adults? Pretty much everyone who celebrates Christmas today gathered with family and exchanged gifts as a child, too, laying the groundwork for adult life. Ninety-one percent of Americans remember gathering with family and friends as a typical part of Christmas, and 86 percent plan on doing the same thing this year. And 89 percent remember buying gifts for friends and family during a typical Christmas season, while 86 percent will do it this year, too. Fewer Americans with incomes under $30,000 plan on buying gifts this year: Only about 3/4 of low income Americans will do so. Homemade gifts, however, trend slightly downward when compared to childhood Christmases: 66 percent of celebrants remember making a gift during childhood, while 58 percent of Americans plan on giving a homemade gift this year. Since adults have less time and more money, shopping just makes thing easier. More women (65 percent) plan on doing this compared to men (51 percent) this year. But there was little difference among different income levels on this question. As for where to put those presents, the vast majority of Americans intend to put up a tree this year: 79 percent. However, even more remember having one in childhood, at 92 percent. Adults in low-income households, along with those without kids, were slightly less likely to report their intention to put up a tree this year. Pew also noticed one, kind of strange trend. A surprising number of adults in a home without children who believe in Santa will still pretend to get a visit from the North Pole. Overall, the number of Americans who will pretend Santa visited their house drops dramatically from childhood to adulthood — 72 percent to 31 percent — but there are apparently lots of people (kids and adults) who willingly go along with the charade. Among those who have a child who believes in Santa Claus, seven-in-ten (69%) say they plan to pretend that Santa visits their house on Christmas Eve this year. But even among U.S. adults without a child who believes in Santa, sizable numbers plan on receiving a visit from Old St. Nick. Roughly one-in-five parents whose children do not believe in Santa (18%) say they will pretend to get a visit from Santa this year, as do 22% of those who are not the parents or guardians of minor children in their household. Overall, one-in-five Americans have a child at home who believes in Saint Nick. These guys are not American, so they don't count. Although two-thirds of Americans still plan on sending out Holiday cards this year, 81 percent remember their families doing so in childhood. And 36 percent of Americans have memories of going caroling, while just 16 percent of those queried plan on doing it this year, according to Pew's results. The survey also notes a big drop in church attendance from childhood to adulthood: overall, 69 percent of Americans remember typically attending a Christmas Eve or Christmas Day ceremony in their childhoods. Fifty-four percent of Americans plan on attending such a ceremony this year. And if Pew's data on traditions by age demographic is any indication, that number could keep getting lower. Forty-six percent of Americans under 30 plan to attend a religious service this year, compared to about 60 percent of Americans in every other measured demographic. 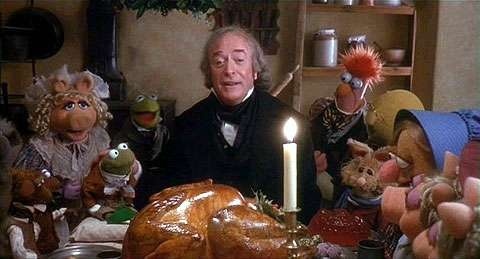 The Public Religion Research Institute , for comparison, found that more Americans plan on watching a Christmas movie, compared to those planning on attending church. The Public Religion Research Institute found a series of striking departures among white evangelical Protestants, indicating that this particular demographic — accounting for approximately a quarter of the U.S. population — celebrates the holiday a bit differently. For one thing, seventy-one percent of white evangelicals celebrate Christmas as a strongly religious holiday, much higher than the 42 percent average of all of the study's demographics. If you're a white evangelical, you're much more likely to read the Christmas story from the Bible to celebrate: 68 percent of evangelicals do this, compared to 36 percent of the population. And, compared to most Americans, you're more likely to believe that the story of Jesus's birth is literally, historically, true: Both Pew and PRRI found that about half of Americans believe the Nativity story is a historical fact. Among evangelicals, that figure is 80 percent. You're also much more likely to attend a Christmas Day or Eve church service (77% vs. 59%). PRRI's results also looked at the ever-present question of what to say to wish someone happiness in the month of December: Happy Holidays or Merry Christmas. As it turns out, more and more Americans prefer the former to the latter In 2010, 44 percent thought stores should say "Happy Holidays" to customers as a greeting during the season, and 49 percent prefer "Happy Holidays" today. Again, unless you're a white, evangelical Christian. While 43 percent of Americans overall believe stores should use "Merry Christmas" as a greeting, 62 percent of white evangelicals believe the religious greeting is more appropriate.